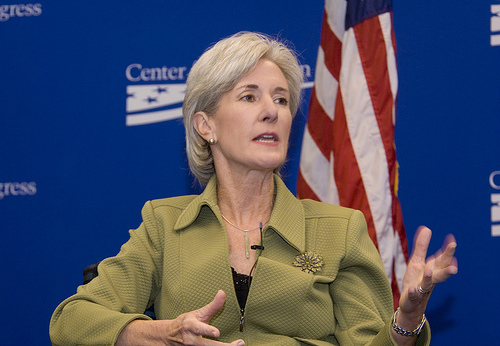 Saturday, Kansas Governor Kathleen Sebelius accepted President Obama’s request to become secretary of health and human services. She sure does have a lot on her plate, what with the proposed overhaul of the health care system. But what you might not know is that Sebelius is a champion of a “bring your baby to work” policy. Currently, 21 government agencies in Kansas allow babies in the boardrooms. We live in a society where too many people make workers choose–do you want to be a good parent, or do you want to be a good worker? Sebelius seems to think: choose both. You’d be surprised. The Parenting in the Workplace Institute says that over 125 businesses and organizations have gone the child/labor route with success. Actually, productivity is great; one of the many reasons cited for the policy. Parental proximity. Mom or dad can respond to baby quickly. Stress levels. Cheerful, chubby babies at work can relieve stress, even for those not toting a tot. Baby policy attracts like-minded employees. It seems to delight most customers. Higher productivity. Employers say that parent/employees often manage their time better around the care of their child. Let’s not forget financial reasons. Daycare costs a bunch, and relieving this burden, even for a few months, can help relieve stress, too! Bonus points for those who babywear and breastfeed their babes. Back to Sebelius. In the 80s, she brought her infant sons to work when she headed her state’s trial lawyer’s association. Later, during the 8 years she was the Kansas insurance commissioner, she put the policy in place there, too. As governor, she was truly an advocate for parenting at work, spreading the policy to 21 agencies total. Many will talk on how she tries to reach across the aisle at an attempt at bipartisanship. But for me, it’s nice to know that someone who will head the HHS has the human side of things down. Ahhh, my friend. You, too, can be a workplace parent. I wrote a series on the matter at Nature’s Child. Check out Babes Working It and Babies at Work: The Guide to Bosses. Image: Center for American Progress Action Fund on Flickr under a Creative Commons License.